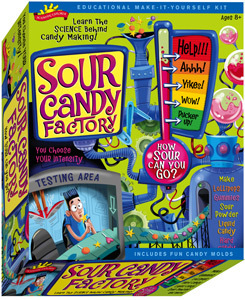 It’s important that I point out that this kit purports to be able to create sour powder candy, lollipops, marshmallows and other things in addition to gummies. However, the recipe for gummies was by far the easiest and quickest, so that’s what we did. As the review says, this product is mostly a fail: severely disappointing contents (why have a box that big? ), ridiculously small molds, and only 2 of them, no container to hold all the parts and ingredients inside, and worst of all, the gummies tasted like crap. However-the product is cool in that it’s unique. At least they’re trying to do something different-to have kids actual make the candy is cool. Just the fact that it comes with instructions of how to make several different kinds of sour candy is neat enough-it might be something to go back to down the road. But ultimately, it’s so deflating opening the box to find a few generic white envelopes of ingredients and a couple petite molds, that it becomes an uphill battle to get behind the it and enjoy using it. Yes, my son was really bummed that there wasn’t a machine inside, but I didn’t need a machine. I needed more molds, and sour gummies that tasted good in addition to being sour. One of two actually IS bad in this case. Really, I should slam this thing, but I’m gonna give it a few stars because it gets kids (older kids) involved, and perhaps by tweaking the recipes a bit (and getting some Goddamn molds, but I’ll shut up about that now) you could come up with some great tasting custom candies. Smaller box. Include a molded plastic tray to hold all the packets, make it look “neat” for the kids. Include 10 molds with larger sizes-generally speaking, these mold sizes are too small. Also, include more flavors, and more of everything. Finally, ditch the generic white packets. Not cool, not fun. The candy looks not so fun — ny. Now that was a spitter. That was a serious spitter. Awesome review and vid. You should try googling “make your Own kits” I have had great sucess with these, and they have a gummies, chocolate, and gum making kits! try gleegum.com good luck! Can I say wtf here? Molds? Where? oh you mean that’s what those to pathetic plastic shape things where? Who are these geniuses that take a awesome idea and trash it for a good bottom line. I will NEVER by a product from them again. Thing is they are not the only ones preying on us parents that try to get kids into creative learning kits. I can’t count the science and craft sets I’ve gotten for my kids and too many have bombed out even the simplest things to make it suit dollar store quality like this set turned out to be. By the way the gummi recipe doesn’t work because it is WRONG! Notice the sugar needed but not used??? yeah that’s the ticket. (BTW thanks Julie for the site – that’s where i found what to do.) Figure out where that belongs and you get something decent out of it. Oh by the way it makes enough to fill two ice cube tray bottoms with approx 1/4″ deep gummies after filling the two so called molds. (in other words the recipe would probably a dozen molds if they were provided.) I did this because i read about the gelatin not taking to reheating to use so you best get it all used up at once or try to cut the recipe up and hope it works ok.
Last comment is imagine my surprise that this same kit is still ripping people two years later….. I definitely agree with you. I did not even attempt to try using it. There is probably $.50 worth of products in there at the most. I am going to return it. It is still be sold 5 years later. Sorry I did not see your post. I just recently bought this toy for my grandsons 10 and 12. What a disappointment and waste of money. When I opened the package I could not believe I had spent $24.99. There was citric acid, corn syrup, flavoring, lollipop molds and sticks. You needed to sugar, 1/8 cup water, non-stick cooking spray, medium saucepan or double boiler, spoon and food coloring. If you did not have a candy thermometer they suggested you drop the molten syrup into cold water. They also tell you Caution: To avoid burn, allow the syrup to cool in cold water before touching it. Give me a break-this is a dangerous. Being a home economics teacher you do not allow children as young as 8 working at a stove without some type of supervision. Even with supervision it would be necessary to watch them with great care.